A beautiful chest of of antique haberdashers boot lace drawers. A wonderful counter top chest of three drawers featuring their original gilt glass labels in a beautigul shadowed font & all retaining their original ornate brass handles. 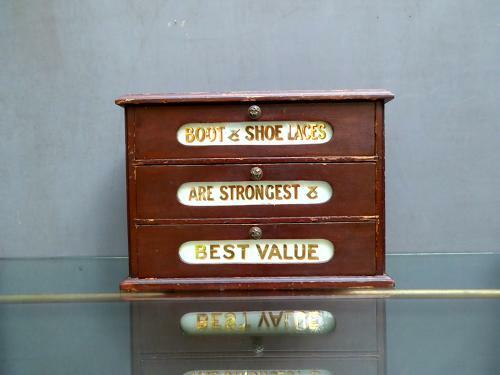 The chest comes in its original painted finish which boasts an excellent age related patina & the drawers retain their original divisions inside which would have been used to separate the different lengths & styles of laces. A stunning, rare & highly decorative example. Wear commensurate with age, good unrestored condition & displays beautifully. Expected wear to the paint in places, most notably the top & one patch of historic woodworm holes to the bottom of the rear panel, treated as a precaution.